These checks were evidently written by EPISD. The full list shows checks written to a car rental firm and goes back to 2013. 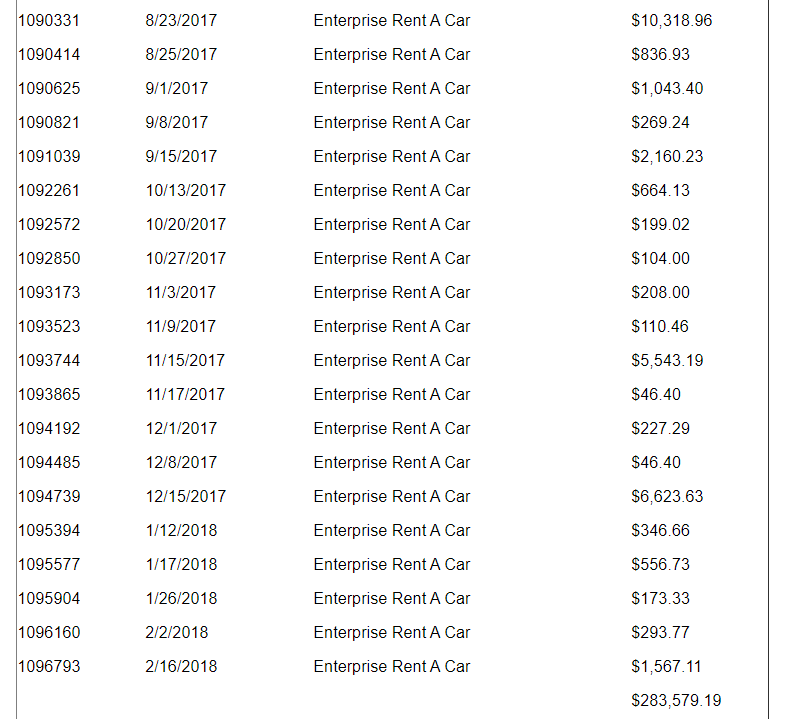 How many cars do you have to rent to get one bill for ten thousand dollars? This entry was posted on Saturday, March 24th, 2018 at 5:00 AM and is filed under El Paso Independent School District. You can follow any responses to this entry through the RSS 2.0 feed. You can leave a response, or trackback from your own site. Just think, in twenty years no one will care because El Paso will have filed bankruptcy and the school systems will be the only local employers left. Of course, the people who stay after “graduating” won’t be very smart. because the current trend in public education has very little to do with actual learning. Last year a group of sewing firms moved here and couldn’t even find 100 people who could learn to sew. Our schools are worse than a cesspool, at least a cesspool has some kind of benefit for its ecosystem. At some point people here are going to have to understand government is not the answer to any of our problems. The local municipal and county governments of El Paso have made things very bad for the residents and are poised to make things worse. We have no real jobs other than government, which are easy to get if you “know somebody” but otherwise out of reach. Education is ridiculously ineffective while simultaneously being an extreme burden on taxpayers. Healthcare is ridiculously expensive. Escobar is bragging about healthcare but I challenge anyone reading this to go to UMC and/or the Children’s hospital and see what they consider “affordable”. Just the amount of paperwork and personal information they require is onerous, and their prices are near the top of industry standards. I don’t know why they brag about that at all. And to think they are subsidized by tax dollars and still charging top rates is an insult. The only good thing about El Paso is the people. And they are leaving. Someday I will leave, going somewhere where the government doesn’t treat me as if I am their personal ATM while they “bureaucratsplain” to me how things have never been so good. The street in front of my house has had nothing done to it in at least 14 years, and I live in a high traffic area. My taxes are not being used for what they are intended. This constitutes an abuse of the taxpayer. Well some VOTERS, School Board have made Cabrera a very rich man. And now he has that almost BILLION$$$ Bond THEY voted for and he and his minions have to blow it all, some how.